Yesterday was parent night to learn about middle school, and all Vail will face next year. It is hard to believe she is so old, and as Shannon and I processed all the changes both internally and externally she will face, we became sentimental. How could this little baby girl be so old? She is still at that precious place between childhood and adulthood, childhood and teenager really. At times, she is so mature and capable that she is like any adult peer. But a few hours later she’ll curl up next to me and need to be held like a little girl and told that everything is going to be okay. But Shannon’s point to me made all the difference in the world. She reminded me how incredibly fortunate I have been to be able to be home with the kids the last handful of years. Although I often have loathed carpool, kid-discipline, and household duties, I would not give anything for the deep connection that has been fostered between me and the kids during this time. The healing process for us has been so graceful and gentle, gradual yet persistent. It is hard to believe it has been almost three years since Sydney died, over five since she was diagnosed. But where God withheld a mother from them, he gave them more of a father. “Most of the time, the sweetest nectar of life eludes us. We know it is there, and we are seeking it on many fronts. Occasionally, we get tastes of it, and it is pure joy. This usually comes from an unlikely source, and occurs by surprise. Often we are searching in the wrong places, and end up with a counterfeit, which leaves a bitter aftertaste. I think a lot of me has even struggled to believe it, which may be why I haven’t blogged much about it until now. When we are burned in life, it is hard to learn to open up again. So we are in the process of blending and molding our families together. We have some challenges for sure, but we also have some advantages. We know what it is like to be a single parent. We both know what it is like to lose someone. As Shannon and I (and four kids) step forward in this new marriage and life together, I pray that we can hold on to this. I pray that we would stay in touch with our stories, where we’ve come, let these stories slay our anxieties about the future and hold our hands open to what comes our way, understanding that God is in charge, and he cares for us. I really feel like the luckiest man in the world now. I love my life, I love every day. I get to be around for the kids, have frequent dates out and movie nights at home with my new bride, work flexibly, and pursue learning at a nearby seminary on the side. God has provided generously for us in every possible way. I am so amazed and grateful. And again, so much of it has been through all of you. Phone calls, texts, meals, prayers, visits, etc. We have the best family and friends in the world. A little over a year ago we came out of an event during which an unknown woman had complimented Vail on her shirt. Upon getting in the car to go home, Vail said to me, “Dad, did you see that lady who was talking to me? Wasn’t she pretty?” “Yes Vail, she was,” I said knowing exactly what she was feeling. After a minute of silence she said, “Dad… I want for you to meet that lady. She was very nice.” I noted that Vail had made her very first reference towards wanting me to date. I was most interested because I had met Shannon a few weeks prior, who I was quite interested in. “Do you know what dating is?” I began the conversation. As soon as it came out of my mouth I knew that this was a milestone moment. On the one hand I was explaining a concept very simply to a little girl and her sister. On the other hand, this moment was part of a story so dramatic, so heartwrenching, so rich with life significance that I felt like I was in a movie scene. Also in this moment, I was faced with how different my path was, compared to the one I set out to travel. There I was, 37 years old, a single dad with three kids, looking to them for permission to go on a date. Fast forward the tape to this past weekend. Over a year has gone by, Shannon and I are engaged, and the kids are bonding fantastically with her. I had all but forgotten that conversation in the car so many months ago. Saturday we went to a parenting seminar with all four kids, and then split up afterwards. I took the boys (Boone and Carson) to watch football, eat pizza and go to bed early, and Shannon took Vail and Mary Haven to dinner and then to the middle school fall play at their school: Cinderella. And then it struck me… Cinderella, the joy and laughter, the acceptance, the bonding and wholeness, the irony of Haven sitting in Shannon’s lap enjoying being held. It is moments like this when I marvel at God’s authorship of life. At times it feels so pointless, so out of control, and then there are those moments when you get a distinctive “wink” from heaven and you just know how very purposeful every moment of this life really is. The following excerpts are from my journal Thursday night. I was at the Red Hill Farm Plantation house, a place where my neighbors, Bob and Bonnie Cerwin, generously let me enjoy many times throughout my life. It has been a very special place to me and I am so grateful to them for its use. I am stirred in a whirlwind of emotion. Even as I write I tear up because I am so stirred. Time moves like a glacier. Unnoticeably slow, often terribly slow, but she moves with such power. It’s almost impossible to fathom that it’s been fifteen years since I’ve been here. How intimately familiar this old house is. The weathered floor, the antique beds, the many fireplaces, the artifacts which also curiously belong in another time and place. This is exactly how I feel at this moment. Oh what I wouldn’t give to be seventeen and carefree. To be half-child and half-man working for $6 per hour in the summer moving hay, mowing fields, mending fences and working cattle… with a bright future ahead, loyal friends by my side and a sweet little girl waiting for me back home. Freedom, music, hunting, fishing and tobacco were all we desired in those days and the farm had all you could eat. I grew up a lot in these fields. I learned the value of hard work. I learned to work together with others and how work can be fun. I learned the value of neighbors and community. When Jake didn’t have a tool for the job we would ride over to Dennis’ or the Newton boys’. You have to care for each other in the country. I learned to be resourceful. One summer, we helped Jake build a shed half the size of a football field entirely with recycled lumber. The rafters came from a barn he took down the summer before, and the posts were old cedar trees he had spotted and marked on the edges of various timber plots. We pulled them out with a chain hooked to the back of a tractor and set them in the ground. A couple of weeks later we were laying tin on the top. I learned the value of doing a job right. Jake was planning on being around this place for a long time, so he taught us to care for it in such a manner. Martha was a fairly young bride, barely in her 30s, who loved horses and longed to be a mother. Soon enough Martha was pregnant and I saw little Branson as a toddler as I moved into my college years. After Sydney and I were engaged, we had an engagement party at the farm. I remember that event as one of the strangest, most oddly emotional things I had ever experienced. It was like I was standing on the playground of my childhood, where in many respects I had become a man, and I was looking deep into the unknown world of marriage, adulthood, career, family and responsibility. I would not have admitted it then, but I will tell you now, I was scared. I was the first to be married of my friends and brothers, and I knew for sure it was a leap of faith. And now, I’m back here, fifteen years later. Branson is seventeen, and my life is oh so very different. Sydney was diagnosed with a brain tumor December 27, exactly four years ago today. We were in and out of hospitals for three years and she passed away the summer before last leaving me with three children and so confused I didn’t know what to do. But, I have not been alone in the sorrow that has befallen me. My two closest friends who also spent their teenage summers here, Matt and Todd, have experienced their share of loss in adulthood. Matt’s dad died of Lou Gehrig’s disease roughly eight years ago. Matt’s father-in-law, who he worked for for some time, recently died in a plane crash, and his brother-in-law died shortly after. Todd and his wife have struggled mightily with infertility and his brother-in-law died suddenly and unexpectedly last summer. And on my way to the farm I learned that sweet Martha has been battling breast cancer for the past several years. Oh how I long for the naïveté of youth. To be young and invincible with inexperience, a small world and small problems. Oh how I wish I could trade in my kid-hauling Honda Pilot for the Jeep I had in high school and spend the summer here. How I wish I could be happy with $6 per hour and rekindle my love for chewing tobacco. How I wish I could heal Martha’s cancer and pull those souls out of heaven and put them back into our lives for just one last summer. But time won’t turn back, it can’t. The glacier has moved down the mountain and it can no more go back than we can. Time is a fascinating irony. Especially when I think of those years and how badly I wanted to move forward, and how badly I now want to go back. Time gives generously, but it takes away without apology. It is brutally inflexible, yet mercifully pushes us through difficulty. As anyone who has lost someone special can attest, each passing year, and each celebration marks a little bit more dying. Dying to the opportunity to be with the one you loved, dying to the life you thought you would have, dying to your role in the life that was taken away from you. What is dying like? It is really scary. You know the scenes in the movies when someone is dangling over an edge holding on to something and they are slipping. The last thing they want to do is let go and die, but there is a point where they realize it is going to happen. It is frightening, disconcerting, and submitting to it runs contrary to the life force within us. But, there is also a release that comes with submitting to death. Getting pinned. Pinned by God. Stopping the wrestling, the wrangling, the flailing. There is a peace, a silence, a sense of spaciousness. There is an opening, a clearing that appears in life that is pregnant with possibility. For every season of crops that must die for the harvest, there is a fall, winter, and spring which gives rise to new life. Death provides opportunity for new life. It is, in fact, a prerequisite for new life. No farmer cuts down a field of healthy crop simply for the purpose of planting anew. That would be foolish. But it is a byproduct nonetheless. And new life beckons, it demands a rebirth. Either the field will fill with corn, or wheat, or soybeans, or it will fill with weeds. Nature abhors a vacuum, and emptiness isn’t an equilibrium state. Isn’t that what we are anyway? We, as creatures made by God, are, at our very essence, empty vessels. We have nothing to offer an omnipotent God, who exists outside of time, who has created the air and the landscape around us. We are designed, and we are put here on earth for a specific purpose… to receive. We are the bride of Christ. We are here because God enjoys giving to us, filling us, blessing us, loving us. So go to sleep tonight with the hope and the expectation of God’s pouring. The pitcher is moving towards you, the cup, and tomorrow morning marks the day when creation held its breath, and watched Him do it for real. Not for merit, not for pity, not for any purpose other than the delight of His heart, and a satisfaction of His nature of love. Receive the lamb of God tomorrow, from the ultimate giver, who came to love and to save. We did not decorate last year mainly because I did not have anywhere near the energy it takes. Sydney absolutely loved Christmas, decorations and all, and always bore the brunt of the emotional and physical workload. In retrospect, aside from lacking the required energy, I think I was protesting. I didn’t feel very celebratory, and in my mind, it wasn’t really possible to do it without her. If I couldn’t have Christmas with her, then we wouldn’t do it at all (or at least we wouldn’t do a good job celebrating). In talking with other widows/widowers at a KinderMourn group, the consensus I took away was that each year after the death of your spouse, you are able to do a little bit more. Well, I am proud to say that we are moving through the holidays and this year, we did decorate! It was a stroke of God’s grace that I volunteered to chaperone on Vail’s fourth grade field trip to Grandfather mountain. Part of the trip included a stop at a Christmas tree farm to discuss the industry as a part of our state economy (could you believe this guy sold 35,000 trees per year!). Anyway, we were able to pre-order a tree and take it home on the bus as part of the field trip. The field trip allowed me to be able to purchase a tree without facing the seemingly impossible task of loading up the car one evening to go pick one out. If there was any one part of Christmas that was Sydney’s, it was picking out the tree. She loved to talk about it and start chattering and discussing and bartering with me on how large a tree we could get weeks beforehand. And she wanted to get it as early as possible. You see, to her, buying the tree was like shooting up a flare to the world that warned, “Chirstmas is ON!” It was like a horse busting out of a racing gate. Like Braveheart, she would charge from the mountain and take on the decorations and parties and evil retailers (who seemed to love her for some reason). In tree shopping, Sydney was also known to implement one of her old thrift store tricks where she would dress up (and require the rest of us to dress up) in not so nice clothes, and drive to the other side of town to try to bargain for an addition $3-5 off the price. Though we have nowhere near her enthusiasm, we are celebrating and doing some things this year. We sat down and talked about it and decided on a tree, a Christmas card, a few gifts and riding around looking at lights! Sydney loved that too! Finally, I wanted to pass along a neat thing that happened tonight as I was putting the kids to bed. It was special blessing, because last night was a little sad as the girls were talking about wishing they had a mom to put them to bed:(. Anyway, tonight I was helping Vail look for a new book to read on my kindle, which she borrows sometimes. We came across “Anne of Green Gables.” It was highly recommended for fourth grade girls and to my surprise, she said she had never read it. It was 99 cents on kindle so I said, “let’s get it.” “Wait a minute,” she said, and she walked over to her bookcase. She took out a hardback copy of the same title and showed it to me. I mean is that not so Sydney… Check this out. So much has happened in the past few months and it is not that I haven’t wanted to blog, but I’ve just had trouble finding a window to do so. Last night, we had a fun firepit cookout with a new friend and fellow widower, Jerel Law (and family). Although Jerel and I just met for lunch for the first time a couple of weeks ago, as it turns out, we have a lot in common. For starters, we both grew up in Raleigh, went to Broughton High School, then Chapel Hill, got married, and moved to Charlotte. We also both love writing (Jerel is working on his third novel) and are single-dads with three kids. Jerel went to Gordon-Conwell Theological Seminary (where I am taking two online classes now) and is a pastor of a church plant in Huntersville, on the north side of Charlotte. Jerel is a few years older, so although we have many common friends, we have never met until now. Anyway, just an example of one of the many neat connections God has put in my path these days. To give you an update, the past few months since Sydney’s death anniversary have really been about acceptance for me. Although I knew Sydney was gone, I think somewhere inside of me I was expecting to be able to get back on the track of my old life. I think I thought I would go back to work in the financial industry, and things would be more or less the same, except for a big hole it in. But, what I’ve come to accept is, “nothing is the same.” That hole affects everything, and the life I was leading is now gone and must be reformed from the ground up. So, it is no longer a question of what my career path should, or can be. 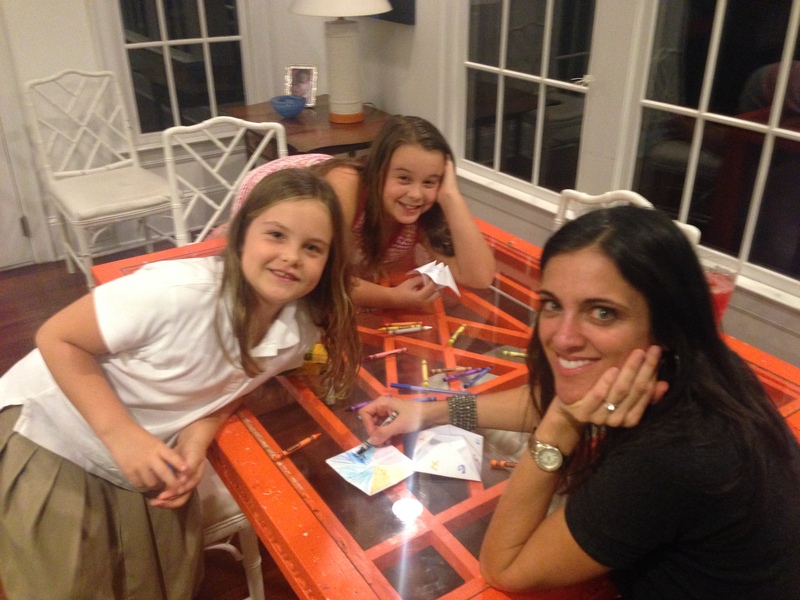 Playing the hand I’ve been dealt requires me to look at my primary responsibility, the kids, and put them first. Through much wrestling, I have come to the determination that they need more of me than I could give them if I were working now. They only have one parent, and I am it. So, I have decided to take the next few years and be a stay-at-home dad. I’m going to put work aside until the kids are off at school and a little more self-sufficient. Then there is a level of dying internally. Dying to the dream of my expectations and hopes. But, it is not a bitter dying, it is more of a letting go of something I now know is not meant to be. While it is a sad, there is a peace that comes with it and a sense that, despite the pain, it will be okay. So, as in all death-related grief, there is grieving the loss of the person, and then there is grieving the loss of each branch of the tree of ramifications created by their absence. Anyway, I am home now and have cut Waverly’s hours in half, which seems to be a good balance for the family and for her. As I mentioned before, I am taking a few online classes at Gordon-Conwell, primarily to explore an interest I’ve had in Christian counseling. Also, it has been really healthy for me, in trying to begin to define “our new life” to have a new learning and growing experience to step into. A neat outing we had last weekend serves as a great metaphor for my life recently. Last Saturday, we took bikes to Freedom Park and started down the newly improved Sugar Creek Greenway towards Midtown. It was absolutely gorgeous. Although Sydney and I lived for six years right by Freedom Park and we had been all over that area, I had never ridden bikes on this section of the greenway. As we headed down the creek bank through the familiar park, we crossed under East Boulevard, where Sydney and I had many many dates both pre- and post-kids. Then we scooted through the campus of CMC Main Hospital. We first went by the inpatient rehab center, where we first visited Dillon Hedspeth in his battle with ALS in the first few years of our marriage. Little did we know that Sydney would spend a few weeks there, on several occasions, as she fought to recover from nerve damage that took away her mobility. Then, as the kids and I rode through the campus, we passed the main towers of CMC, where Sydney gave birth to our first baby, Vail. We brought her home on a snowy day in January, with ridiculous looking white knit clothes that were hilariously large for her little six pound premie body. And it was in this same tower, a handful of years later, Sydney would stay as we fought her brain tumor, as her symptoms became unmanageable from home. And on several occasions, when things were most tenuous, Sydney was moved to the top floors of the ICU, the place where she would eventually draw her last breath. Beyond the big towers, and above the high banks of the creek running beside the greenway was the Blumenthal Cancer Center, where we spent many many hours with her oncologist, discussing scans and treatments and getting infusions as well as consuming Starbucks and Chick-fil-a. And at the far end of the hospital was the ER, where some of the darkest moments of fear guided us to a place of desperation. She was admitted several times, when we weren’t sure if she would make it out. But, on Saturday the sun was shining brilliantly and all the darkness of our hospital experience was blotted out by a warm and peaceful sunny day. And indeed, as we passed underneath Morehead Street, beyond the campus of CMC, up the hill of Harding Place, I could nearly see the KinderMourn house. This is the place we go on Monday nights for the kid’s group therapy. They bound across the threshold to the one place in the world where they are “normal”. They come out of their sessions with smiles and snacks and stories of new friends who have also lost “loved-ones”. I have a pile of collages and letters and crafts made in honor of Sydney, collected from KinderMourn, as the kids are encouraged to work their grief out with their hands. Then, on the other side of Morehead, as the greenway rose out of the creek bottom to higher ground, we began to follow along parallel to Kings Drive. We past Maharani, the first Indian restaurant Sydney and I ever ate at. This began an obsession that led us to try many many Indian restaurants in remote parts of Charlotte. 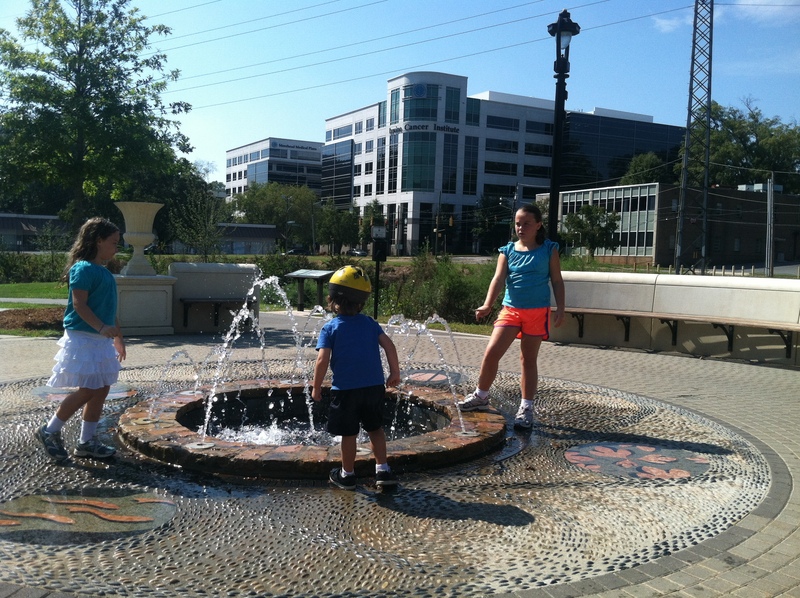 We then took a break at the new water feature in the Midtown park, just long enough for the kids to cool off and Boone and Haven to fully soak their clothes and shoes. I sat on a park bench across from one of Sydney’s favorites – Great Harvest Bread, not far from Baskin Robbins, the object of one of her dominant pregnancy cravings. Then, as we approached the skyline of downtown and I thought of how many hours and years I spent working in those buildings, it occurred to me that while all of these places were so familiar, I was experiencing them in a completely unique way, from a completely new vantage point. I no longer saw these landmarks in the same light; they evoked very different emotions and thoughts. And it occurred to me that this was a great metaphor for the life I now live. In some ways it is very familiar and an extension of my life before Sydney’s death. Many of the people and places, the raw materials, if you will, are the same. But in another way, her absence has triggered a massive shift in my perspective and experience, much like the Sugar Creek Greenway, which travels through common landmarks, but below or beside the familiar routes. This creates a sort of new dimension, a new perspective, a new experience, a new life. And it’s not that the old life is gone. It is still there and it shapes the current experience. They are distinct, but also, they are part of the same story. Thanks for the tidal wave of support the kids and I have felt over the past couple of weeks of the anniversary of Sydney’s death. I really have been overwhelmed at the magnitude of care I have felt during this time and I know my parents and Sydney’s parents have experienced the same. I had a special time last weekend sitting back and listening to the audio of Sydney’s funeral, something I haven’t done since shortly after her death. Even though I remember nearly every detail about it, I was impacted once again how God wove the story of her life, and how well it was represented by all who contributed to the funeral sharing and set-up. It is a beautiful and moving tribute, but also a compelling “sermon” of sorts, which affects and changes you to hear it. Being reminded of this, I want to encourage each of you to find time one evening, or morning, or Sunday if you can’t make church, to listen to it (just scroll down on this page until you see August 29, 2011). The audio quality is pretty good, so try to hook up to some external speakers if you can. Later in the day, after listening to the funeral, I was reminded of an old song that Sydney and I used to love listening to in high school. It is called “Gulf Coast Highway,” and is sung by Nanci Griffith and Darius Rucker (you can listen to it here). I started laughing when it popped up on my iPod because I remember playing it in the car when we were dating, taking turns singing the duet as if we were performing. This kind of thing was hilarious to do with her because she would get SOOO into it. I can see her now pointing at the windshield with one hand and commanding a pretend microphone in the other. I don’t know what this all means, but I have to say that I am more curiously open the perspective of living in a amazing story, which has meaning and connectivity in ways more powerful and detailed than we can imagine. We are living in a masterful painting, in which our lives are simply one unique stroke of one unique color, with unique texture that will never be repeated or duplicated in this painting, or any other that will ever exist. So is this all connected for meaning? Perhaps, certainly in some way. But it may be nothing like the connections that I have drawn. Living with eyes for the beauty of God’s creation in life and human flesh, and His redemption of us in a fallen world, is like being aware of a new dimension. Whether it’s a song on my iPod, or significant life event, God has a persistent, yet gentle way of reminding me that I am in an wonderfully woven story. Of late, the most front and center reminder has been the latest trauma in the lives of my dear friends, Amy and Adam Patwa. For those of you who don’t know the connection, Amy and Sydney became friends, I’m going to guess about five years ago, when they rode up together to a Hope women’s retreat. They quickly discovered that they were two nonconforming nutty women with free spirits and a lot to laugh about it. They were close almost instantaneously and continued to bond over the next couple of years when they were both, in their early thirties, diagnosed with cancer. Who would’ve thought that two young women in such a small church would receive such devastating news in a very short time, shortly after becoming friends. So, God began to weave our stories together. Well, just a week ago, the day after the one year anniversary of Sydney’s death, Amy and Adam got some difficult news that her cancer was spreading significantly. So, on August 30th, we gathered in the Adult Ed room at our church for an emergency prayer meeting for them. Truthfully, I wasn’t even going to go at first. I was so exhausted by the emotions of the anniversary that I was secretly glad to see that we had “Back to School Night” scheduled at the kid’s school; I immediately reasoned that I was already busy. Thankfully, a dear friend gently reminded me that both of my kid’s teachers would be glad to meet with me another time if I would just email them. My heart was heavy again as I spoke to Adam last night, but incredibly full to hear the signs of God’s faithfulness to them in this terrible time. So many amazing ways God has been loving them though the horror of this awful trauma. How can it be? But it is. Please pray for my friends. You can follow their story at http://www.caringbridge.org/visit/amypatwa. Is It Better to Solve Problems, or Create Them?